Click the "Back" button on your Web Browser to return to the team index above. Breed: Belgian Shepherd Tervuren, "Ari"
Certifications: Wilderness Air Scent Search. Ari is Cindy’s 3rd SAR dog. Certifications: Arin is certified as a Flanker for MESARD, and has been a MASAR Ground Searcher certified since 2010, with search experience while on Mid-Coast SAR. She is a fire fighter Advanced EMT with ocean rescue training, and is a licensed Athletic Trainer for the state. She has been a member of Maine Task Force 1 since 2010. Arin joined MESARD in 2014 as a Flanker providing navigation, communication, and first aid. Jim is a certified Wilderness Ground Searcher and certified Search Team Leader with previous experience in both air and ground search and rescue in Alaska, and he maintains certification as a Wilderness First Responder (WFR). Jim joined MESARD in 2007 as a Flanker, providing navigation, communication and first aid support. Certifications: Jenga is certified in Wilderness Air Scent Search, Article Search and Advanced Land HRD. Chad joined MESARD in December, 2014. Certifications: John returned to MESARD in 2017, after being a MESARD Dog Handler from 2005 to 2009. John is working as a Flanker. Certifications: Reyna is certified in Wilderness Air Scent Search. 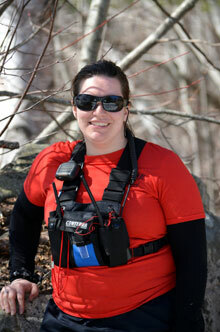 Jennifer is one of the founding members of both MESARD and Mount Desert Island Search and Rescue. Reyna is her 6th SAR dog. Certifications: Jet was MASAR certified in Wilderness and Water Shoreline HRD, and IPWDA certified in Wilderness Land and Crime Scene HRD. Michele has been a member of MESARD since 1992. She is an IPWDA SAR Instructor in HRD, Wilderness and Water Search. Jet is her 5th SAR dog. 2016 American Humane's Hero Dog: Search & Rescue Dog. Kobuk is certified in Wilderness Air Scent Search. 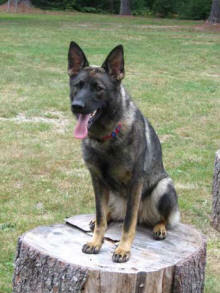 Prior to joining MESARD in 2012, Kobuk passed both the NAPWDA (North American Police Work Dog Assoc.) 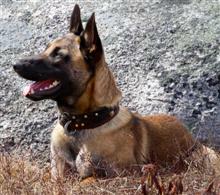 Advanced K9 in SAR in 2011, and the IPWDA 40 acre Wilderness Search Test in 2012. Elizabeth is NASAR SARTECH II certified, and earned her MASAR Ground Searcher certification in 2005. Certifications: Jax is certified in Trailing and is Spencer’s third SAR dog. Spencer has been active in SAR since 1994 as a member of Lincoln Search and Rescue’s High Angle and Swift Water Rescue Team and he has been a member of MESARD since 1997. He maintains his Wilderness First Responder Certification and is a certified IPWDA SAR instructor in Trailing, Wilderness Air Scent, HRD Land and HRD Water. 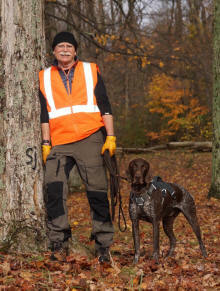 Certifications: Gracie is in training for Wilderness Air Scent Search and is Sean's 3rd SAR dog. Sean is a registered nurse in an ER and ICU, and a paramedic firefighter. He has been a member of MESARD since 1996. 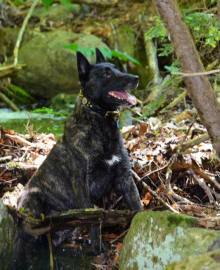 Certifications: Maddy was certified in Wilderness Air Scent Search and Water Search. Maddy is now retired. Jay has been a member of Waldo County Search and Rescue since January 2007 and a member of MESARD since July 2007. Certifications: Vrijheid’s Eron is certified in Wilderness Air Scent Search and Wilderness Human Remains Detection, and is certified in IPWDA Land and Crime Scene HRD. Leslie has been a member of MESARD since 2004. Eron is her 2nd SAR dog. Certifications: Pepsi was certified in Trailing. David is a firefighter/paramedic and has been a member of MESARD since 2004. Pepsi was his 2nd SAR dog. Certifications: Reese is certified in Wilderness Air Scent. Jake is a Firefighter/EMT for the City of Lewiston. He has been a member of MESARD since 2012. Reese is his first certified SAR canine. Certifications: Jet was certified in Trailing. 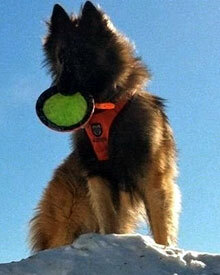 Ronda started SAR dog work in Washington State in 1994. First working with German Shepherd Search Dogs ( GSSD) of Washington State for 10 years, then All Breed Canine SAR ( ABCSAR ). She was also affiliated with Washington Explorer Search and Rescue of Kitsap County. After retiring in 2013 she moved to Maine and started working with MESARD. Jet is her third SAR dog. Certifications: Sardee is certified in Wilderness Air Scent Search. Paul is an EMT and has been a member of MESARD since 1988. 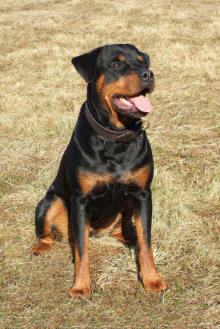 Sardee is his 3rd SAR dog. 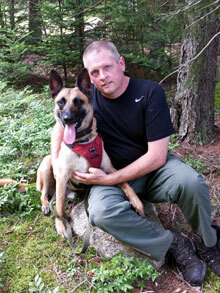 Certifications: Kato is certified in Wilderness Air Scent Search and Wilderness Human Remains Detection. Irene has been a member of MESARD since 1999. 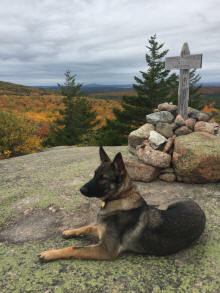 Kato is her 4th SAR dog. Certifications: Roni is certified in wilderness air scent search. Troy has been a member of MESARD since 1999. Roni is Troy's 3rd certified SAR dog. William joined MESARD as a Flanker in 2014. 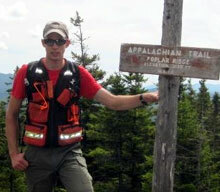 He is a Registered Maine Guide, and is a driver for his town's ambulance service. Certifications: Raven is certified in Wilderness Air Scent Search, and Wilderness Human Remains Search. 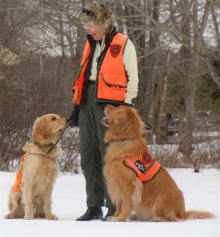 Deb was the Training Coordinator for the Maine Warden Service K9 Team and is one of the founding members of MESARD. She served as Training Director for MESARD’s first 25 years and currently is President. 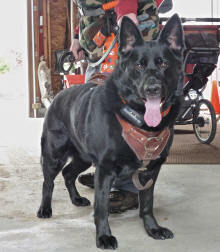 Raven is her 6th SAR dog. Before Raven, she trained German Shepherds for SAR and law enforcement work. 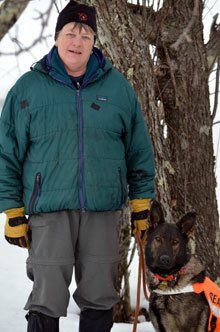 Deb retired from the Maine Warden Service after 30 years of service as a Maine Game Warden and is now offering dog training services under the business name of Maine K-9 Services, including online courses for search and rescue dog handlers. She is a Master Trainer for search and rescue for the International Police Work Dog Association, a Maine Criminal Justice Academy certified K9 trainer, and a Level II Trainer with the United States Police Canine Association. Breed: Australian Shepherd, Certifications: Aggie was certified in Wilderness Air Scent Search and is now retired. Dan is a Master Maine Guide. He is also an animal control officer and a member of his community's fire department. Dan has been involved in search and rescue for over fifteen years, ten with MESARD. Dan returned to MESARD as a member in February 2007. Aggie is his 2nd search dog. Certifications: Drift (on right) is certified as a Trailing dog. 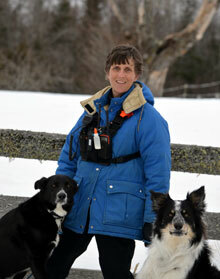 Kelly has been a SAR dog handler since 1985 and is currently serving as MESARD's Training Director. Certifications: Zeke was certified in Wilderness Air Scent Search. 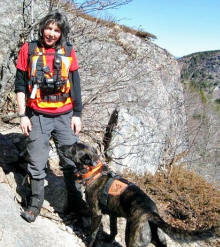 Sarah trained her first SAR dog with MESARD in 1988 and is currently working her 3rd SAR dog. 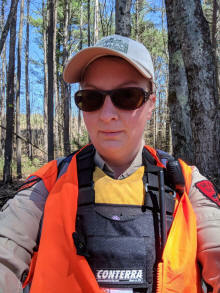 Certifications: Melissa is a MASAR certified Ground Searcher, and serves as a board member of Franklin Search and Rescue. 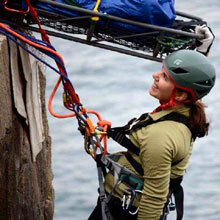 Melissa is also a certified Wilderness First Responder (WFR) with extensive rope rescue training and experience. 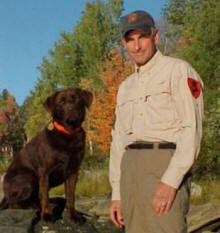 She is also a registered Maine Guide. Melissa joined MESARD in 2014 as a Flanker and assists the team with navigation, communication, and first aid. Certifications: Tala is certified in Wilderness Air Scent Search. Dorothy is a registered nurse, and has been a member of MESARD since 2012. Certifications: Angel is working toward her Wilderness Air Scent Search certification. Beth has been a member of MESARD since 1987 and has trained and certified two Rottweilers for Wilderness Air Scent Search, Water Search, Evidence Search and Wilderness Human Remains Detection. Certifications: Spirit (right in photo) was certified in Wilderness Air Scent Search, and was in training for Shoreline & Water Search. Splash (left side of photo) is currently in SAR training. Nancy has been a member of MESARD since 1998. Spirit was her 2nd SAR dog and Splash will be her 3rd SAR dog. Certifications: Wren is certified in Wilderness Air Scent Search. 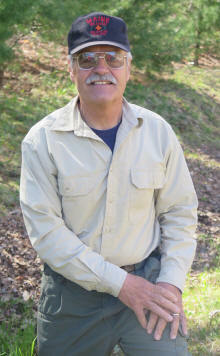 Chip has been a member of MESARD since 1989. Wren is her 3rd SAR dog. Chile Peppa is now retired. Anne joined MESARD in 2016 after a year with Wilderness Rescue Team. She is MASAR certified as Search Team Member, has a Wilderness First Aid certification, and as a Flanker she provides navigation, communication and first aid support. Anne is also a licensed Massage Therapist.